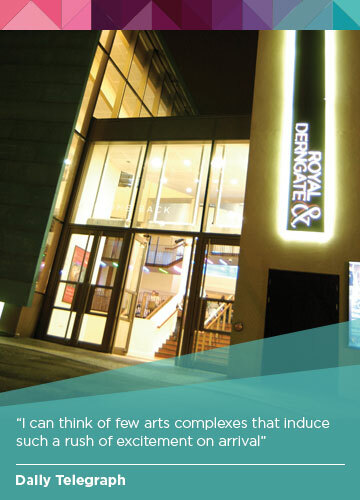 Royal & Derngate, Northampton includes three main spaces – The Royal auditorium, the Derngate auditorium and Underground, plus the Northampton Filmhouse which is adjacent to the theatre. The 450 seat Victorian Royal auditorium houses a mixture of presented and Made In Northampton productions, the multi-purpose, multi-configuration Derngate, with a maximum capacity of 1500, welcomes large scale touring shows, orchestral visits and a host of one night events, and the flexible Underground spaces are home to our Get Involved programme and studio-style events. The building is also home to a number of bars, a box office and other meeting rooms available for hire. In addition to these auditoriums, the back stage areas house the Made In Northampton workshops, paintshop and wardrobe. The Royal Theatre, which opened in 1884, was designed by the renowned Victorian theatre architect C J Phipps who also designed the Theatre Royal Bath, The Lyceum in Edinburgh, Theatre Royal Glasgow and the Grand in Wolverhampton. It is a Grade II listed building. Whilst it has a nominal capacity of 583 seats, its practical capacity is 450 given the nature of the seating on the gallery benches. It is a ‘producing’ house and is supported by workshop and wardrobe. In 1927 it became home to the Northampton Repertory Players and has run as a producing house ever since, staging at least six ‘in-house’ productions each year. Amongst many famous actors to tread the boards at the Royal, the most notable is arguably Errol Flynn who was a member of Northampton Repertory Players in the early 1930s. The Derngate was opened in 1983. A Northampton Borough Council initiative, the venue was designed by RHWL for multi-purpose use. It can be configured to stage a variety of events including classical concerts, musicals, opera, dance and even ‘in the round’ events such as snooker tournaments. 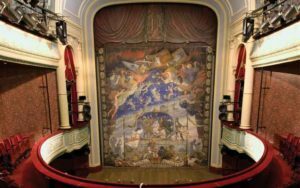 It has a maximum capacity of 1,500 for classical concerts, with 1200 seats for ‘lyric’ performances and has been run as a touring theatre since. 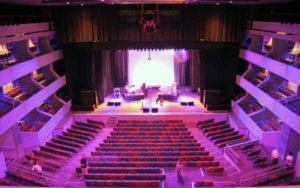 The configuration of the Derngate Auditorium (as it is needed for classical concerts to comedy, musicals to flat floor music events) is changed on a regular basis. Using a time-lapse camera, this fascinating process has been captured in action – just click on the link below. Our Underground spaces are a centre of creativity regularly housing some of Royal & Derngate’s most varied, community and family focussed work, including our Made In Northampton interactive productions targeted specifically at Under 6s, our monthly comedy night Screaming Blue Murder and housing our Community Actors and Youth Theatre productions. It also regularly hosts VIP nights and trade events and its versatile spaces are used for business meetings, launches and one-off events. 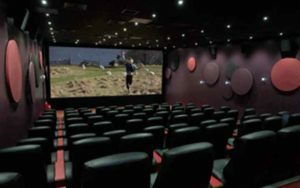 The Northampton Filmhouse promises the discerning Northampton movie-goer an unrivalled cinema experience, hosting the very best in world, independent and mainstream films. Its two intimately sized screens both have state of the art sound and digital projection equipment. They benefit from luxurious leather seating, with individual side tables, allowing audiences to enjoy a glass of wine as they watch a film. Along with additional events such as film-maker Q&A sessions, and themed seasons, there are Parent & Baby screenings for parents and carers with babies under one, and Silver Screen screenings aimed at our more mature audience.